Welcome to Villa Julia and Villa Andrea, the perfect choice if you are looking for a Luxury villa in Corfu. 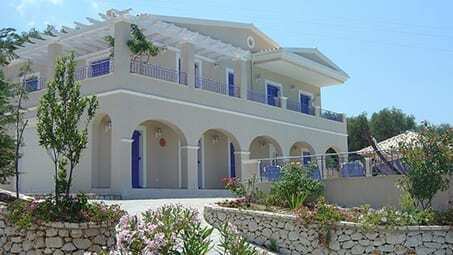 Our two beautiful Luxury villas in Corfu are nestled on an unspoilt corner of the island near Kassiopi. Just a short distance from it’s beautiful beaches, each of our stunning Corfu villas offers beautiful accommodation with every modern convenience, stylish modern furniture, spacious terraces, acres of private gardens and large private pools. All set to a backdrop of picture-perfect landscape views which stretch from the deep blue Mediterranean and miles of white sandy beaches, to the rugged mountains beyond. The perfect setting for memorable Corfu villa holidays. Whether you’re reclining by the pool or enjoying an aperitif on the balcony at sunset, each glance is filled with miles of open sky and a panorama of lush trees, shrubs, fragrant flowers and flourishing olive and citrus groves. 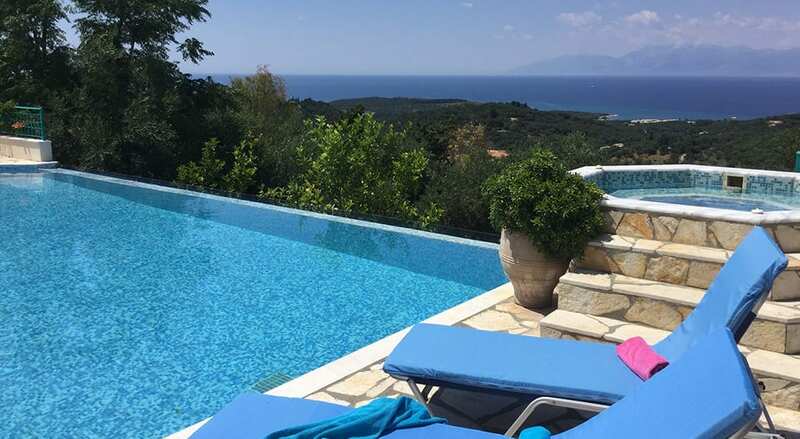 Nestled on an unspoilt corner of the island, Villa Julia and Villa Andrea are the first choice for those seeking a Luxury Villa in Corfu with complete privacy and serenity. With an abundance of space, Villa Julia and Villa Andrea are ideal for family holidays and groups of friends, as well as those who simply want to get away from it all in sublime style. Refined and elegant, each villa offers peaceful tranquillity coupled with the convenience of easily accessible local amenities and an indulgent full service option with maid and chef. Look around our luxurious Corfu villas, see our breathtaking sea views and begin planning your next island escape. Set in 3 acres of abundant olive groves on the unspoilt north east corner, discover what it really means to get away from it all. Why not add an indulgent full service option when you book your Corfu holiday villa? Additional services include chef and daily maid. 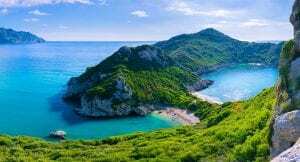 Forget what you think you know about Corfu. A stay at Villa Julia or Villa Andrea invites you to enjoy the authentic sights, tastes and smells of the real Corfu. As a boutique Corfu holiday villa business, we’re committed to making your stay on the most beautiful coastal part of Corfu unforgettable. What can I say? Our entire stay was just perfect! The villa was amazing (Villa Julia) both inside and out. It was hard to drag ourselves away from that amazing sea view! We’ve already been talking to friends about a group escape next year! Just what I needed. A real haven for the stressed out professional, so peaceful and private. We did venture out locally a few times and everything was in easy reach, but you can’t beat sipping a cold beer overlooking those views! We will most certainly back next year! 3We booked the Villa Andrea as a family celebration for our 40th wedding anniversary and bought the whole family along with us. The adults loved the peace and the kids loved the pool! The chef was amazing and cooked us a fabulous meal and the maid service meant I didn’t need to lift a finger. Total bliss! Thank you Corfu Villas for making our stay so special. I’ve stayed in many so-called luxury villas over the years but when Corfu Villas say luxury, they mean it! The bedrooms were huge, light and airy with amazing views and it was lovely to wake up and enjoy the quiet solitude that we’d all be craving after a challenging few months. We can’t wait to return. The villa was just beautiful and so well maintained, I spent hours just exploring every nook and cranny. The sun terrace was a great spot for a big family breakfast and we ate dinner there most nights the weather was so good. The kitchen was well equipped and had everything we needed for a really enjoyable stay. Loved it, loved it, loved it! Even our grumpy teenagers were overwhelmed when we arrived after a less than smooth flight from Manchester! A great spot for some quality family time and much needed R&R. I’ve never written a review about accommodation before, but I couldn’t not get in touch to say how much we enjoyed our week long stay at Villa Julia last month. It’s everything we wanted in a villa and so much more, and that view! Thank you so much, we’ll most definitely be back! Thank you for going above and beyond for us when we stayed with you back in August, when our original villa cancelled on us last minute because of water issues your team pulled out all the stops for us and provided us with an amazing villa that was far better than the one we’d previously booked! Great location, gorgeous villa and amazing customer service. Thank you! Words can’t express how much we loved this villa! It was perfect for my 50th birthday getaway with the girls and we felt like film stars with our private chef and maid service. We can’t wait to come back again with our families and have a few after dinner drinks on the sun terrace. We were all so impressed with the villa that we are planning to book again with you next year. The villa is perfect for a larger family that lives in different parts of the UK and it was great to get together in such a gorgeous location. We’d love to do it again sometime and will be in touch.